The Norwegian artist Bjarne Melgaard is the shooting star and enfant terrible of the international art scene. In recent years he has expanded his agitative and stylistically difficult to define painting style into an exciting, vibrating arena of comprehensive mediality. 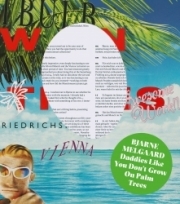 In the exhibition “Daddies Like You Don’t Grow On Palm Trees” in the Friedsrichshof Collection, Melgaard connects his work with that of the Viennese Actionists from the 1960s to create a spectacular installation. Bjarne Melgaard lives and works in New York City. Numerous exhibitions, among them Friedrichshof Collection, Zurndorf, Galerie Thaddaeus Ropac, Paris, Munch Museum, Oslo, Frieze New York, Institute of Contemporary Arts, London, 54th Biennale di Venezia, Venice and Galerie Krinzinger, Vienna.